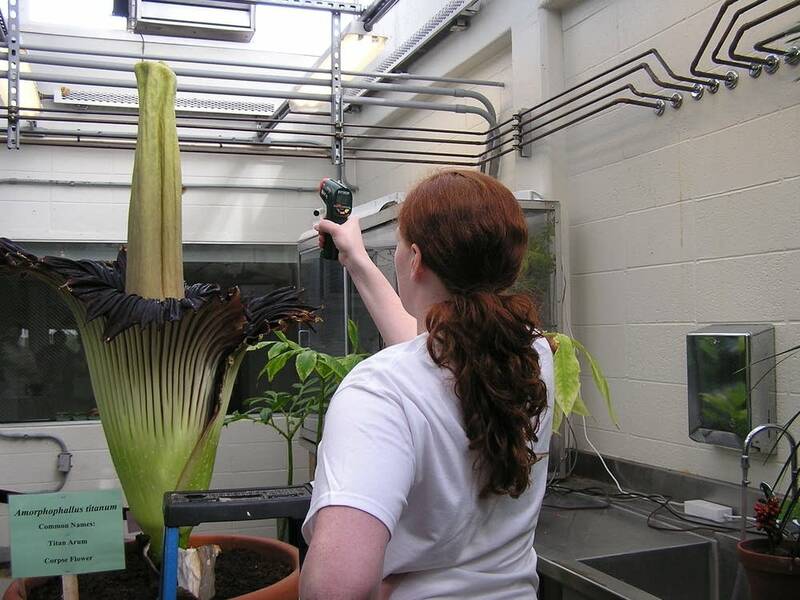 Chemistry professor Brian O'Brien says most of his life he's been hoping to grow a corpse flower, ever since he as a child. About two weeks ago it looked like the corpse flower was about to bloom, and he's been waiting, updating his blog and webcam, checking the greenhouse's humidity. "It's surreal. The whole last week and a half have been like a dream almost," he says."Yeah. It's very weird. There are just so many people who have been so enthused over it. My entire time at Gustavus I've never seen so many students so transfixed by something simultaneously." Chemistry student Emily Pelton is one of the transfixed. She and another student have been helping O'Brien monitor the plant. She says as soon as it started blooming Saturday evening, it also began smelling. "I think it's almost-rotting vegetation," she says. "Rotting garbage. Some people have described it as a pail of minnows that have set in the sun for a couple days. We had one guy who had actually smelled a rotting corpse, and he said it was very, very similar to the smell." The plant only stinks for about 12 hours. That's one of the many rare things about the plant. 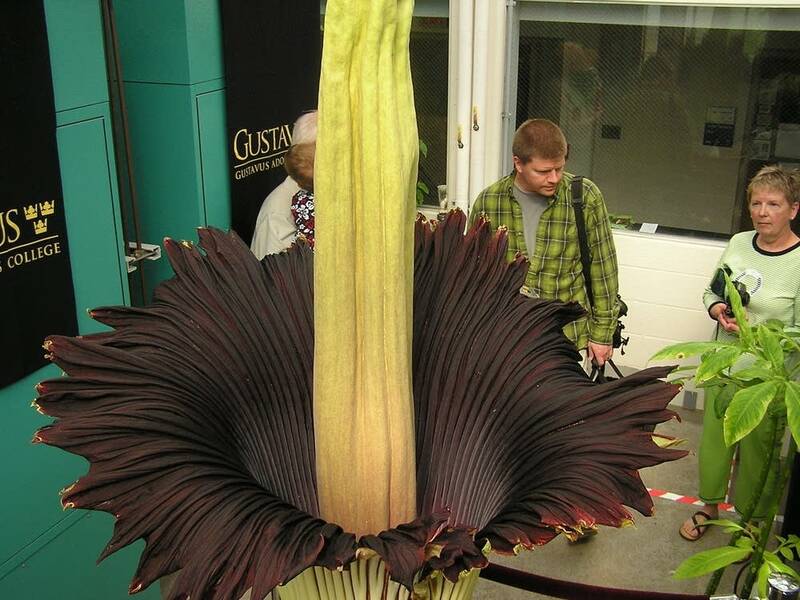 It's as tall as an average woman, and blooms for just two days. 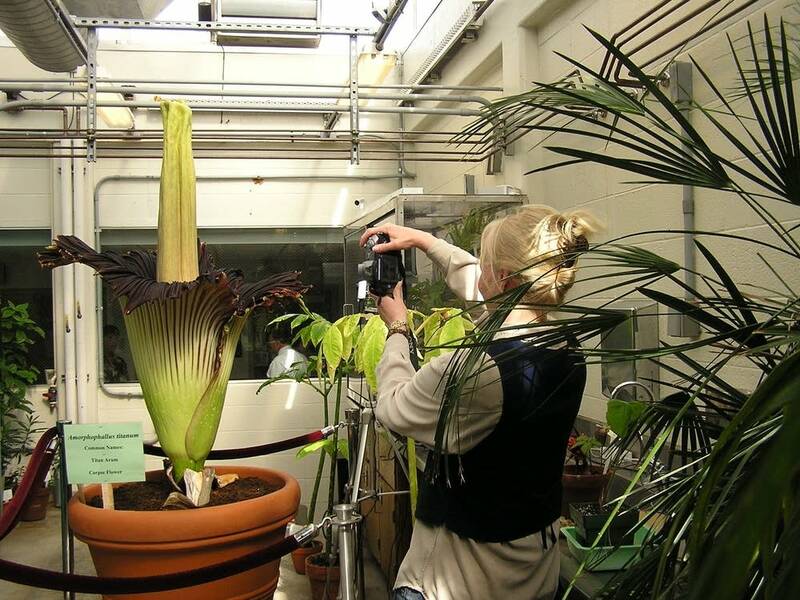 In just the first few hours, 1,000 people snapped photos and took whiffs of the plant. The bloom will likely close Monday. The nickname "corpse flower" comes, obviously, from the flower's smell. 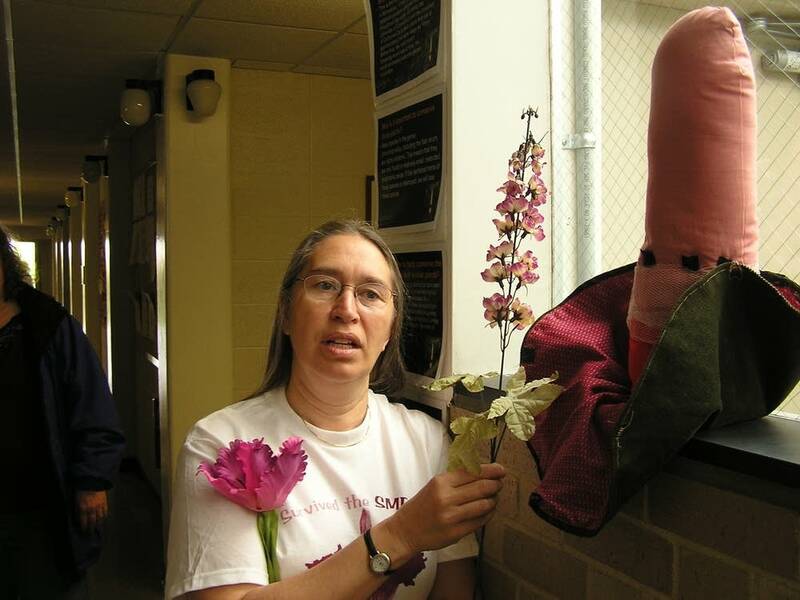 Biology professor Cindy Johnson-Groh says the flower actually has several names. 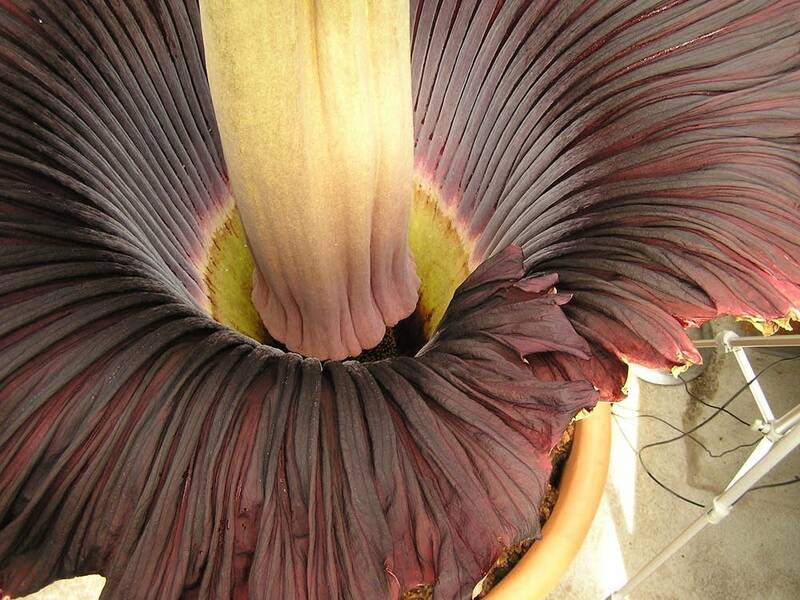 "Titan arum, banga banga, what's the others? Then there is a bunga bangkai. Those are Thai, I think," Johnson-Groh recalls. Its Latin name is Amorphophalus titanum. A long, cylindrical structure called the spadex extends out of the flower's base. It's chartreuse at the top and crimson at the base. 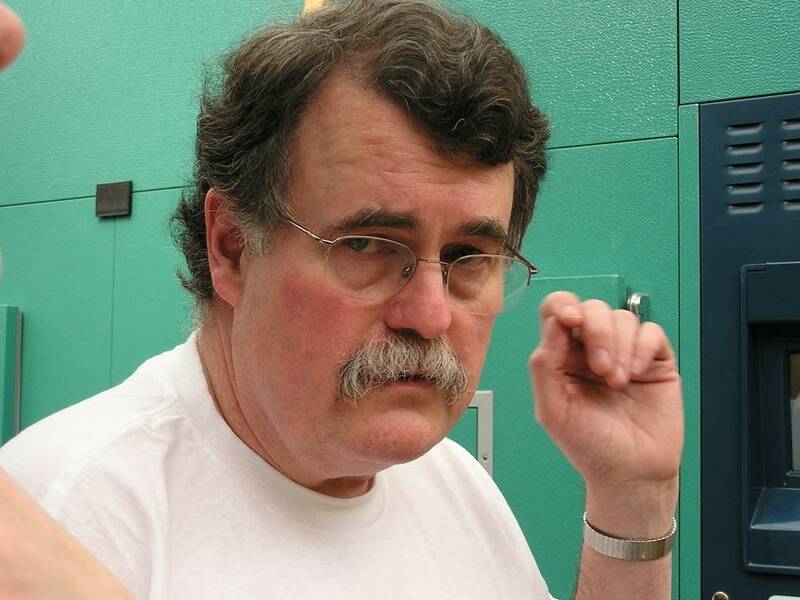 O'Brien explains the spadex heats up to 100 degrees. "So the spadex acts kind of like a chimney that wafts out this fragrance that attracts basically any insect that would be attracted to a rotting animal carcass," O'Brien says. That includes carrion beetles, sweat bees and flies. The bloom surrounds the spadex. It looks like lettuce. Its underside is green and rippled. The interior is burgundy, almost the color of dried blood. The corpse flower is actually hundreds of male and female flowers all tucked inside the bloom. They look like little spores. Emily Pelton says she's been amazed by the blooming process. "You'd stand here for even 10 minutes and you'd see that it come toward you more," she says. "It was really exciting because you could see it grow. Instead of watching it passively, you could actually see it coming toward you." Tod and Connie Stokman have been watching the steady progression of the plant on O'Brien's blog. Connie strains on tip toes to take a photo of the bloom's center. "It smells exactly how I thought it would smell, too. Maybe a little less because I guess we always anticipate it's going to be way worse," she says. "This isn't as bad as I thought it would be," Tod says. "I saw some of the other ones online, and this isn't as vibrant, the color of it. It's a lot darker, the color of the flower itself." Tod Stokman muses to himself, whoever dreamed that it could get so big. It actually could get bigger. The flowers are said to live up to 40 years, and grow well over 10 feet. This corpse flower will bloom again in three years, after it sends up a new leaf that will shoot to the roof of the greenhouse. Flickr photos of 'Titan Arum"